A total of 10,067 dossiers from the period of martial law on Taiwan known as White Terror have been preserved till today. Each represented life or death for 10,067 people and each verdict sealed an individual's fate. To commemorate Human Rights Day, the first lot of verdicts on 232 political victims during the 1950s was made public on Dec. 10, 2014. Among the 10,067 dossiers are 2,102 digitized Microsoft Word files, including 1,270 verdicts in an easy-to-read format. Because the political victims are of advanced age, the Ministry of Culture has decided to make a part of the dossiers public while sorting out the others. The National Human Rights Museum is also making an all-out effort to interview the political victims and their family members and to preserve the nation's oral history. The Ministry of Culture will place the official verdicts and the oral histories of the prosecuted side by side for people to cross-reference the opposing viewpoints of history. The first lot of digitized verdicts is now available for people to apply for reading rights. 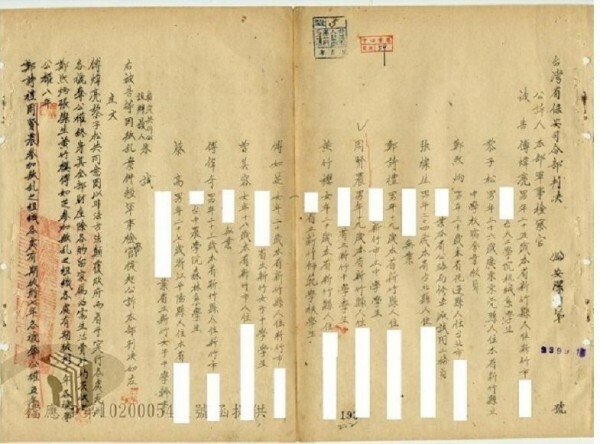 Those who are interested can apply in accordance with the "Regulations Governing the Opening and Application of Verdicts in Transferred Compensation Dossiers” (provided below in Chinese only). The National Human Rights Museum will contact the applicant within 30 days after receiving a complete application. Visitors Today:130. All Time Visitors:1,229,937.